This phonograph was made in the seventies especially for the Swedish National Phonogram Archive, since then reorganised and greatly expanded. It seems most of the transcriptions have now been made, but the machine is still in use when needed. It is a solid piece of engineering, and indeed made by an engineer. The player is mounted firmly on a box with legs and wheels, the box containing power supply and other things, and the whole assembly is rather heavy. The mandrel is made of aluminium and mounted on a large and heavy flywheel made from a Sela gramophone turntable blank. Speed is now measured with a hand-held electronic rpm-meter that senses the passage of a slip of white paper taped to the edge of the black flywheel. 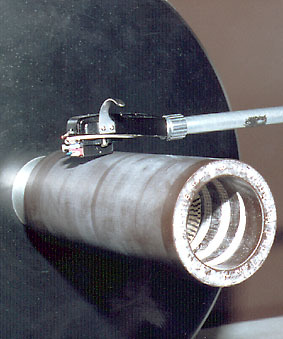 The tone arm is an adapted Ortophon arm. It is long, the stylus-to-pivot distance is about 55 cm. Its base is mounted on a slide, so it can move sideways for adjustment if need be. The slide in turn is mounted on a spongelike,vibration absorbing material. As the mandrel is open to the right, the arm moves from left to right, and the cartridge has to be mounted backwards in the headshell. The player is equipped with a Quad preamplifier, mounted in the box, but it is no longer in use. The signal now passes through a Stanton 310 preamplifier, mounted on the baseboard. Originally there was also a Klein&Hommel UE100 filter to correct the tone curve. Mr. Hansson says a high resolution filter is a necessity to listen to the old cylinders, as the tone curve varies greatly and follows no standard. Front view of the whole player. 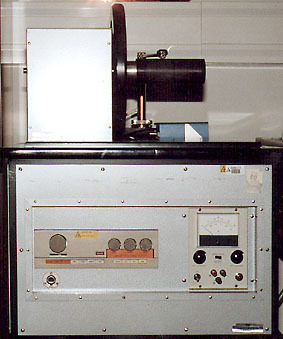 To the left on the front, the Quad preamplifier no longer in use. To the right voltage control for the motor. As the tone arm moves from left to right, the cartridge has to be reversed. 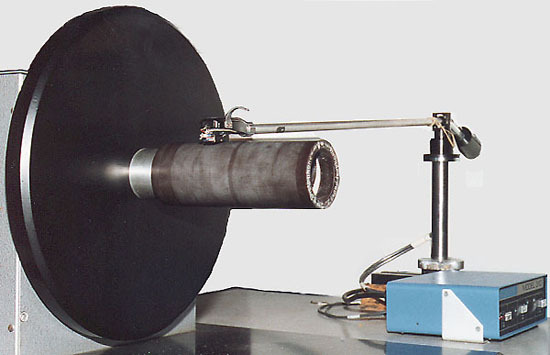 At the end of the mandrel, inside the cylinder, is a stroboscope.